A hosted PBX, also called virtual PBX, is an advanced VoIP telephony system that allows enterprises of all sizes to have multiple phone users, using extensions managing all communications. Enterprises can manage easily and with no need of technical knowledge their hosted PBX (and therefore their phone system) from their online control dashboard. 1. What can I do with a Hosted PBX? 2. How does a hosted PBX work? Hosted PBX is a cloud based service and all extensions connect to it through the Internet. Both incoming and outgoing phone calls connect through the virtual PBX that handles them as configured. Some hosted PBX allow enterprises to add mobile phone numbers to call queues to answer phone calls; and some VoIP providers even offer apps to make phone calls from smartphones, with no need of internet access, using the PBX system. Hosted PBX allow all sized businesses to have a complete telephony system and set it up according to the enterprise's needs. Employees will be able to connect to the phone system from different locations. Furthermore, it includes lots of features such as automated greetings, auto attendant, call transfer and divert, music on hold, conference calls and much more. Hosted PBX allow enterprises to use several phone numbers in an enterprise​. Each user will be using an extension that connects to the PBX and will have the ability to call and answer phone calls. This is a key point for every enterprise as their phone system should be able to handle every phone call in rush hour. Employees should be able to make phone calls and customers should be able to call you even if employees are busy. In this case, they will be waiting in a call queue until someone gets free. The number of simultaneous phone calls a hosted PBX can handle depends on the number of hired channels. As a VoIP customer, enterprises can add more channels to its system as needed. Most VoIP companies provide their users with phone numbers from different states and countries and can be used from any location. Lots of times these phone numbers are called virtual phone number due to the ability to be able to be used from any location with Internet access. For enterprises with foreign customers is a must to have phone numbers from the countries their customers are from so that they can call the enterprise doing a local phone call. This is one of the most used feature of hosted PBX. It´s a recorded locution that customers listen to when calling the enterprise. It allows enterprises to show their customers they have called to the right place and it improves their brand image as only professional enterprise use it. You can set automatic opening hours when so that your phone system adapts to your enterprises schedules. Normally the hosted PBX will show a different message to callers based on the hour; and it can even route the call to one or other place based on the time. The IVR menu diverts callers to the department they want to talk with. It does kind of the same work a secretary does by giving options to callers and diverting the phone call based of what the option selected. It´s an easy way to route phone calls to the appropriate department, saving time both for the enterprise and the customer​. Call transfer is also a very used feature that allows employees to redirect a phone call to another department or colleague. Some hosted PBX even allow to transfer phone calls to mobile numbers. Without it, customers would have to hang up and call back in order to get in touch with the right person/department. These 2 features allow enterprises to organize extensions into groups to unite departments and distribute incoming phone calls. Enterprise can unify the phone system of their different locations using a single hosted PBX for all their offices. Most VoIP providers offer free internal phone calls to their enterprises users, so that they can call from office in EEUU to the office in Europe with no charge. Cloud PBX can be set up in lots of different ways to handle incoming phone calls. Enterprises set up their PBX to adjust it to how they operate. You can use the auto attendant to send phone calls to the right person/department and, if case nobody answer, you can still redirect it to another extension/hunt group or even mobile number. You can redirect phone calls to a department based on the number they have call to or even based on the number that is calling. On the image you can see how a Hosted PBX works. On the top it's your VoIP provider and your Hosted PBX with all your phone numbers. You access it throught the Internet and gives you phone line. 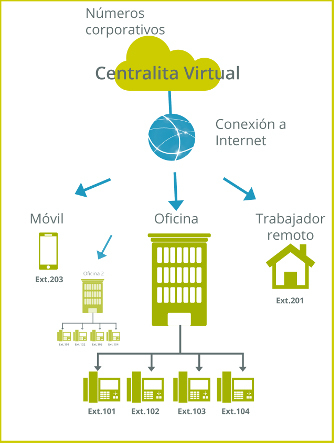 Offices at different locations connect to the same hosted PBX throught the Internet: a remote user with a smartphone, offices and a remote employee. Phone extensiones can be located on different places and connect to the same hosted PBX through Internet connection. Your hosted PBX contains all your phone numbers and information about how to handle phone calls. It also provides phone line to each extension. Each phone call that is done from and to the enterprise goes through the PBX. Based on different rules it decides what to do with the phone call, which locutions to show and much more. Phone extensions are always connected to the hosted PBX through the Internet. This allows enterprises with offices in different locations to share the same PBX to handle all phone calls and to provide phone line to every extension. Each time someone calls the enterprise the hosted PBX handles the call and checks different information such as the phone number they've called, the date and time to decide how to manage the phone call. Then it will show a locution and route the phone call to the pertinent department/extension. When a user makes a phone call the hosted PBX will specify the public phone number it must show. PBX can also block certain phone calls based on destination or in time and date. Extensions need to connect to the hosted PBX through the Internet to have phone line. 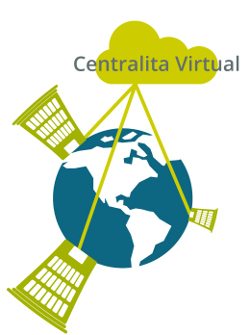 The bandwidth needed for your VoIP system depends on the number of simultaneous calls that are going to be done. For each phone call it's recommended 1mbps down/up. Hosted PBX users need to have devices with Internet access to use the VoIP line service. VoIP phones. The most recommended choice, best quality and features. VoIP ATA adapter. Allows you to use conventional phones with VoIP. Softphones with computers / smartphon. Softphones are apps/programs that emulate phones and allow you to answer and make VoIP phone calls with your computer or smartphone. It's really important to have access to a complete online dashboard to manage everything in your hosted PBX, from call reports to IVR, call queues and extensions management. Check which features and actions you can manage from your online dashboard. Customer support is the cornerstone of enterprise's phone services. When choosing a VoIP provider for your hosted PBX make sure they have a good customer support that really care about helping their users. If there are no technicians in your enterprise make sure your VoIP provider will set up the virtual PBX for you. Best VoIP providers make documentation to help their users manage their services. For big changes you will probably ask your customer support and for small things you may want to them yourself. And even more when changes are frecuent. If your enterprise is located in Spain you will want your VoIP provider to have their servers located in Spain and not in USA. The closer the servers to your company, the better quality phone calls will have. When using a server located in another country (the furthest, the worst) the voice travels to that server and then back to you on each phone call. And this usually means delays. Hosted PBX allow you to use more types of phone numbers than traditional PBX, improving how you can communicate with your customers and partners. Enterprises using hosted PBX have an advantage agains those using analog telephony as they can use phone numbers from other locations. You can buy fixed phone numbers from other estates and use, for example, a phone number from Madrid while your enterprise is located in Barcelona. You can even share a phone number between offices located in different places. Some VoIP providers allow you to use even mobile phone numbers. The use it's not very extended on hosted PBX. Even though premium phone numbers with higher rates than usual are being used less and less (customers don't like them) some enterprises may still want to use them for several reasons. Enterprises can use fixed phone numbers from the countries where they sell so that their customers can contact the company by doing a local phone call. It's a lot easier to sell products and services in another country when customers have the security that they can call you at a normal rate. Nomadic phone numbers from Spain are those who start on 51 and are not associated with any province. Sometimes phone numbers used with VoIP telephony are called virtual phone numbers: fixed, mobile, premium and international phone numbers. The reason is that when using a phone number with VoIP it's no longer fixed to a location and you can use it from anywhere with Internet connection. Enterprise can port the traditional phone numbers to VoIP and also the other way round. The process is always the same: you ask for the number portability to your new provider and it will take care of all the process. Enterprise migration from traditional telephony to voip with a hosted pbx is an easy and fast process that allows enterprises to set everything up and start using it before making the portability of the phone numbers. The key point of the process is to set everything up and start handling incoming and outgoing phone calls with the new system before the phone number portability so that not even the employees will perceive the change. Buy a hosted PBX with a VoIP provider and all the VoIP devices you need. Set up the hosted PBX and create all the extensions you need for your users. You will have to set up working hours, greeting, call queues, auto-attendant, etc. Set up each VoIP phone/device with an extension. You don't need to set up all of them but is recommended so that you can verify all of them are working perfectly. Make a request to port your phone numbers to your VoIP provider. If you are going to port a phone number that is linked to your Internet connection make sure make sure with your current provider what will happen with your Internet connection. If they will cancel also your Internet connection try to get another number with them and associate it to the Internet. You will have to move to the next step before right after you request the phone portability and before the portability it's over. The day before your phone numbers are going to be ported to your new provider you have to forward all phone calls to a provisional phone number on your new hosted PBX system. This way you ensure no one will even notice the change as users will be using the new VoIP system both for incoming and outgoing phone calls even before the portability is over. Once your phone numbers are with your new VoIP provider the migration it's over and you just have to delete the provisional phone number your where forwarding the phone calls to. No additional changes are needed and all your new telephony system is now using VoIP and your Hosted PBX.